i had the same problem, took it to the dealer and they couldn’t figure it out. I asked the service advisor to check the technical bulletin and they found a known issue with homelink and LCA (lane change assist) signal interference. The fix is to pull the fuse for LCA, program the garage door opener (it should work with the LCA fuse pulled), put the LCA fuse back, and you should be good to go. Did the dealer pull the fuse and then you drove home and tried it successfully or did you just get the "clicker" to work at the dealership and then they put the fuse back in for you? I'm pretty sure my garage door has the rolling code so it will require first connecting the "clicker" to the overhead console and then synchronizing the overhead console with the garage door opener in the "learning" mode, which obviously has to be done at my home. I'm reluctant to pull the fuse by myself but maybe the Dealer will send a technician over to my home and charge it to the warranty??? Exactly how did it work in your case? I have tried everything but I can't even get started on linking my garage door opener to the car. I spent 40 minutes on the phone with Homelink support. I gave them the model number of my Chamberlain Lift Master garage door opener and the model number of my "clicker". I also watched the Ocala Porsche video but my problem is I can't even get the blinking orange light to turn green at the beginning of the process. I press the clicker button after telling the "wizard" I want to program button 1 and hold it pointed at the overhead console and finally the system just times out and says failure to connect. I tried using other buttons on the console and on the "clicker" and even tried my other "clicker" with no success. The Homelink person suggested I try installing brand new batteries in the "clicker" so I will give that a try tomorrow. I am going to go the dealer next week anyway so hopefully they can figure something out. Any advice based on your experience will be appreciated. For what it's worth, I have failed to program my garage door with each of my past several new cars whenever trying to follow the instructions for training the car using the remote clicker. What has always worked for me is using the button that is located on the door opener motor itself (up near the ceiling). With my opener, you can climb the ladder, press the button and then get the car to register with the opener. (After pressing the button you have a time window of, say, 30 seconds or maybe a minute.) With this procedure, the remote clicker is not needed for the training operation, as the pairing operation takes place between the opener motor and the car directly. This has always worked for me. Please keep us in the loop if it comes on again. My E-Hybrid is due to arrive in two weeks, and I'm getting nervous reading all this "check engine light" business posted by so many new owners. Nobody needs or wants that kind of aggravation in the first few weeks of getting the car, and I hope a fix comes quickly from Porsche. I'm guessing that this is an E-Hybrid problem that doesn't surface in ICE-only Panameras? I wonder if it has to do with the engine turning on and off frequently. Well, after two weeks without the car, I am picking it up this afternoon. They have replaced temperature sensors. I believe these are the sensors that monitor the hybrid battery temperature. This is, apparently, an experiment, as they are not really certain that the sensors are the culprits. The car's diagnostic logs recorded two separate faults, at least one of which may have occurred while the car was parked in my garage. I'm not sure whether it would have been charging at the time or not. The local service department has been in back-and-forth contact with support in Germany. I'm not sure if this is the good news or the bad. They have not seen any recurrence of the problem. At one point I was asked whether my garage has a big heat source, e.g., machinery. No. Well, is your back bumper parked near a hot door, e.g., a dark-colored garage door in direct afternoon sunlight? Why yes, it is. Hmm. Make of this what you will. As I understand it, even a transient fault condition will cause the check engine light to illuminate and remain on. Once it comes on, it will stay on for a period of time; but if enough time passes it will turn off again. (Not sure how much time this takes or whether it varies according to the underlying fault condition.) So the light's being on does not necessarily mean that a fault condition persists, only that one has occurred in the more-or-less recent past. Hey guys, I am was just curious can you rev the E-hybrid when your start off ? I have seen some videos of them reving but i believe they start off in hybrid mode as standard ? so how can you rev them while not in motion ? Did you program your E-Hybrid that way? You just ignored the "Garage Door Opener" wizard in the system? If so, if I understand what you are saying, you just pushed the learn button on your garage door opener and then went back to the car and held down button 1? If that's not what you did, please elaborate. the dealer pulled the LCA fuse, programmed my clicker, put the fuse back, and I synchronized the rolling code when I got home by pressing the button on the garage door motor when the homelink is in synchronization mode. Hope this helps! You just put it into Sport or Sport + mode and the ICE comes on and then you can rev it all you want. Also, in Sport+ mode you can use the Launch Control. Good news about the LCA fuse. I have an appointment on Monday morning to have them pull the fuse and then hopefully I will be able to program the overhead to the "clicker". Assuming that works it will take me about 45 minutes to get home and then do the synchronization with the rolling code. Hopefully it won't time out. Regarding the Launch Control, I haven't yet tried it on my car as I'm trying to follow the manual and wait until I have 2000 miles to exceed 4000 rpm. That said, the car I drove at the LA Porsche Driving Experience only had 400 miles on it and the Launch Control worked perfectly and the message did appear before I let up on the brake and launched. Not sure how high the rpm was at launch but it was very impressive!! I've done launch control multiple times. What I've found is that the engine needs to be warm in order for the blue message stating "launch control" to appear. If the engine is not warm, you will not get the message and the car will not launch at the correct rpm. Once the engine is warm, just follow the steps to activate launch control and it should work. Hope this helps. Could anyone with the Ionizer option speak to whether it actually makes a difference in air quality or not? I know it's a cheap option, but I don't want to give Porsche free money. I've seen in videos that there's an actual option on the screen for it, but I don't know what you could in its menu. I did spec the ionizer on my order. As you said it's not expensive and I have allergies to grass and tree pollen so it seemed a "no brainer" to me. I made sure it was on when I picked up the car and it has remained on ever since. Not sure how to tell if it has made a difference or not since I've not been operating without it, but when I'm in the car I am very comfortable and my allergies don't bother me, so I guess it is helping. Are you usually unconformable, in terms of allergies, in cars that do not have an ionizer? Yeah, I’ve tried it multiple times afterr driving with ICE for several miles and engine temp is 200+ degrees. Left foot on brake, right foot slam down on pedal, engine only revs up to 3000 rpm, and no message. In the spirit of full disclosure, and at risk of giving you an unsatisfying response, here's what I recall about programming the garage door on my 4 E-Hybrid. First I tried to follow the instructions in the car and using my remote control clicker, but I couldn't make that work. After a couple of failed attempts (and recalling previous failures from previous cars), I tried the alternative route of using the button on the opener motor. This worked on the first try. I interpreted this success as independent of first having tried to follow the car's instructions, but I may be wrong about this. It is possible that using the clicker first was actually a necessary step which then made the second approach successful. So, if in doubt, you might do both as I ended up doing. The description above also omits the interjection of a few choice words, so you could try that part as well. My car has finally arrived in sunny Scotland. 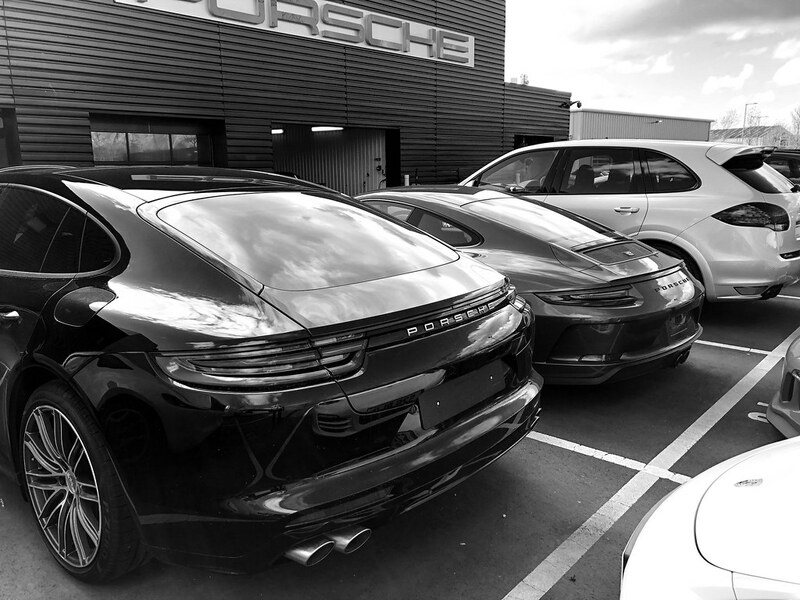 I knew before my salesman thanks to the Porsche car connect. Due for collection on moday. I had to stop in and see it and check the boot space with the Burmester, this has really been the only thingsI have been unsure off and unable to get any real guidance from the dealer. You will loose some space but not sure how much. Doesnt look that bad. Loved that nice new GT3 Touring happened to siting next to it.